…and, long after the sun has set beyond the Kemmelberg, we just have time to take a look around. On entering the cemetery we encounter the lone headstone of Private Edward Burnell Wilkins, one of 69 men killed during the Battle of Messines in June 1917 whose graves are in this cemetery. He has the unusual grave reference of Special Memorial near Plot I Row B on Right of Entrance, and you will have noticed that his headstone is inscribed with the words ‘Known to be buried in this cemetery’. The first six graves in Plot I Row A are in fact from late September and early October 1918, among the later burials in the cemetery. 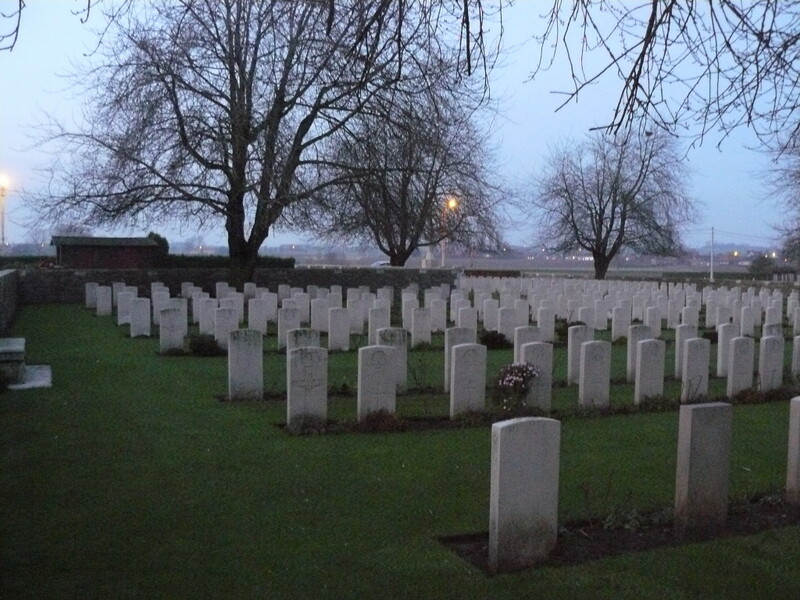 Many of the graves in Row B behind are among the earliest burials, from late 1914. 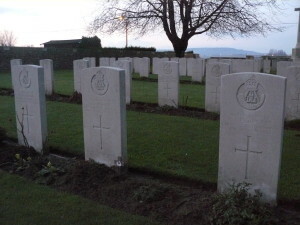 Rifleman Johnson of the London Regiment (City of London Rifles), the fourth headstone from the left in the front row, was actually an alias for his real name of Ernest Cecil Ames. More September 1918 burials in Plot I Row A; this time the men buried in Row B are all casualties from the summer of 1917. 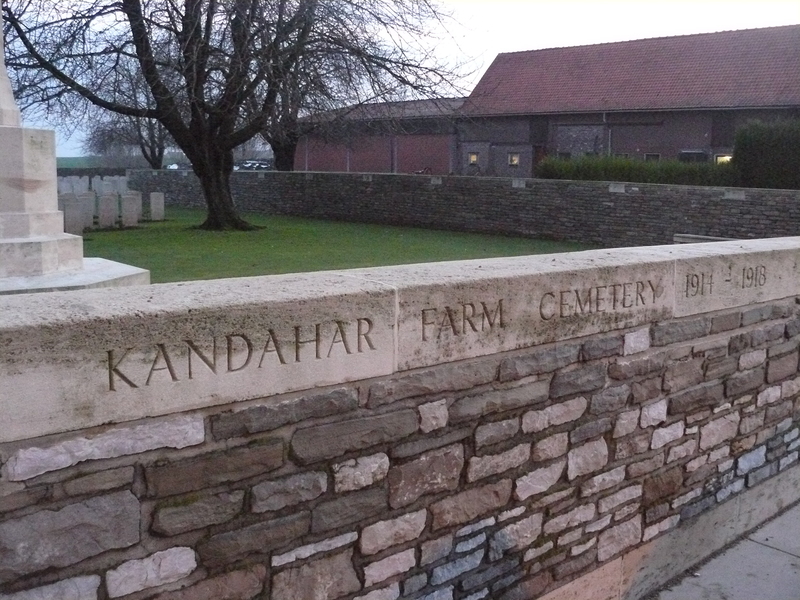 Here’s the Kandahar Farm Cemetery Plan. 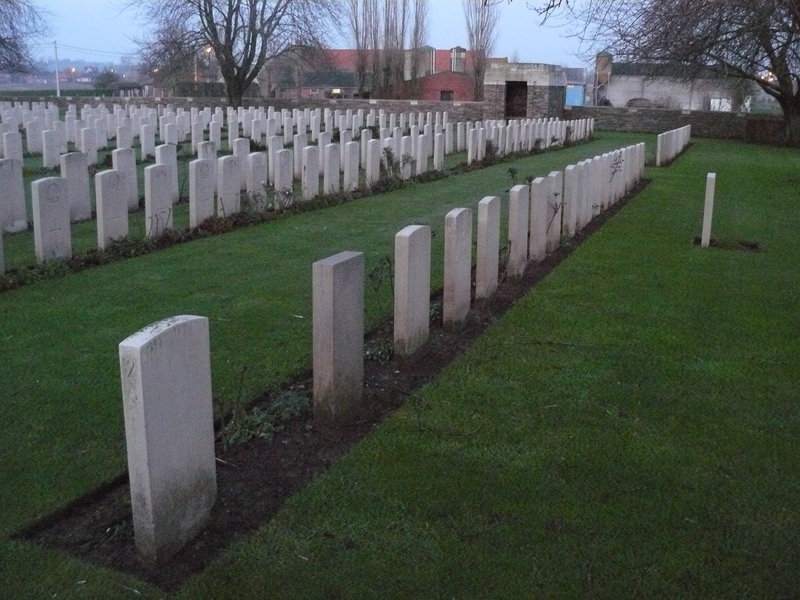 The earliest burials, mainly men of the Manchester Regiment killed in November 1914, can be found in Plot I Row C.
South westerly view across the centre of the cemetery, Plot I on the right, Plot II Row K straight ahead, and the rest of Plot II to the left. 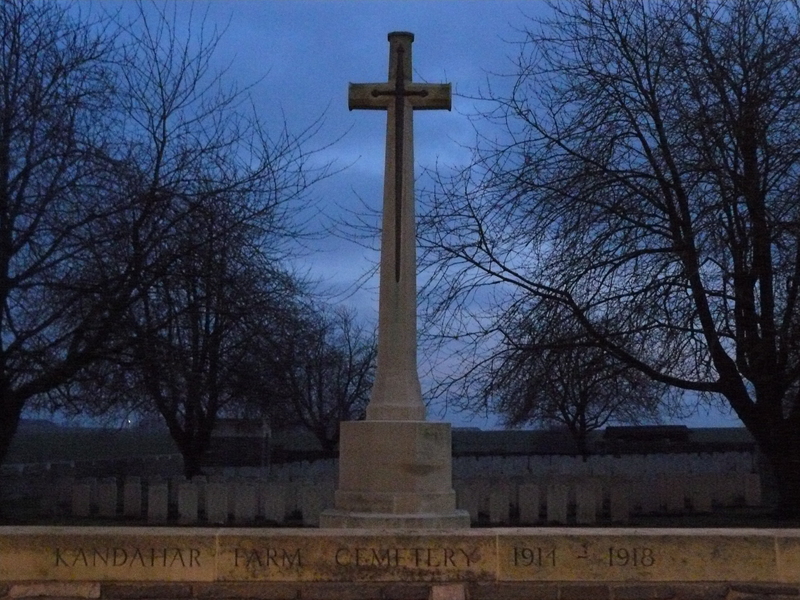 The cemetery entrance is beyond the Cross of Sacrifice. 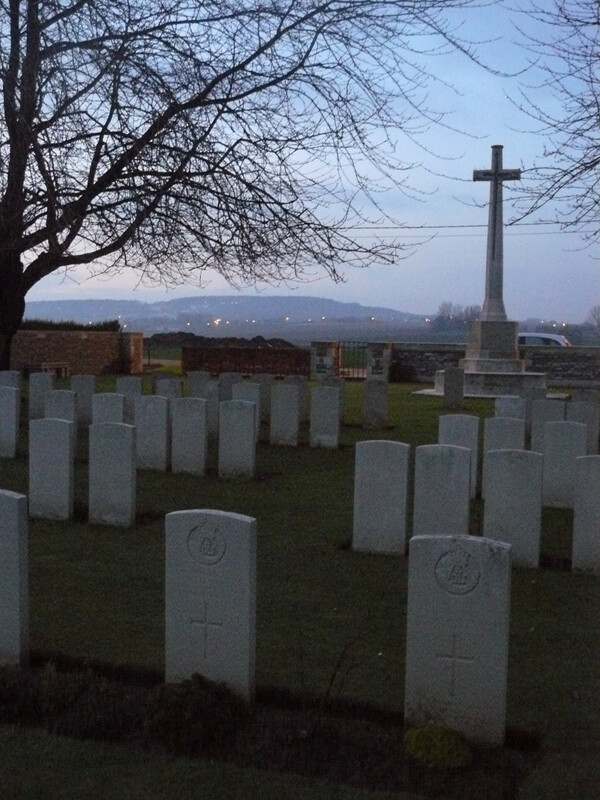 The cemetery was begun in mid-November 1914 and used until April 1918, when the Germans captured this entire area. It was used again in September and October as the Germans were pushed inexorably east towards the war’s end. 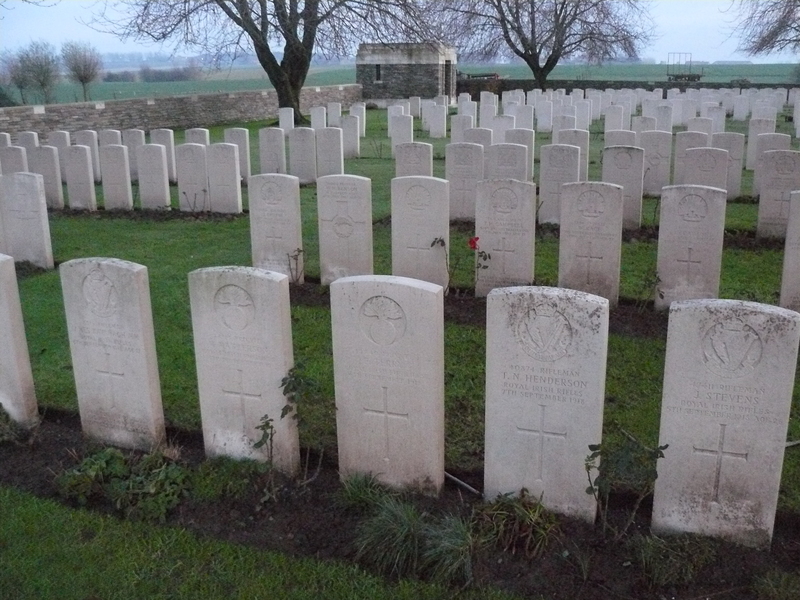 There are now 443 burials here, of which eleven are unidentified. Another unusual grave reference: Plot II Row A Behind Grave 10. 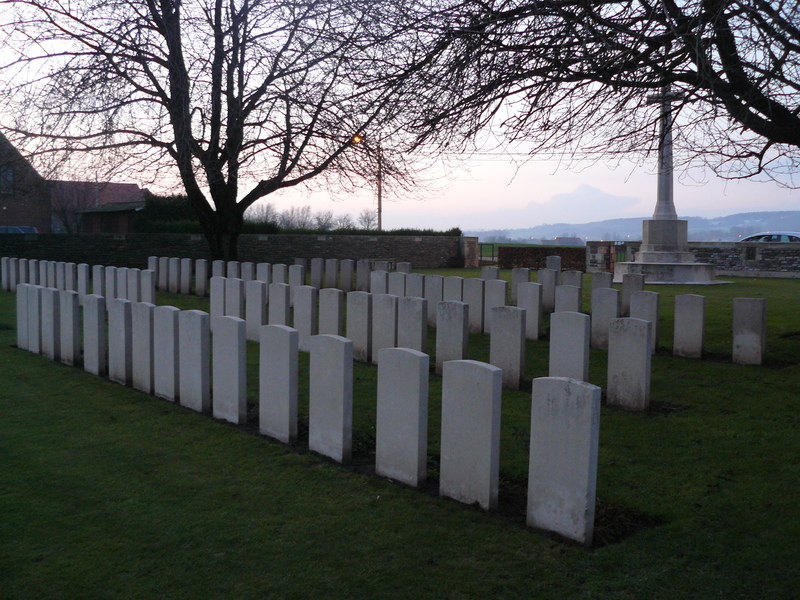 56 burials were made here between early September and mid-October 1918. View from the south west corner looking north across Plot II. 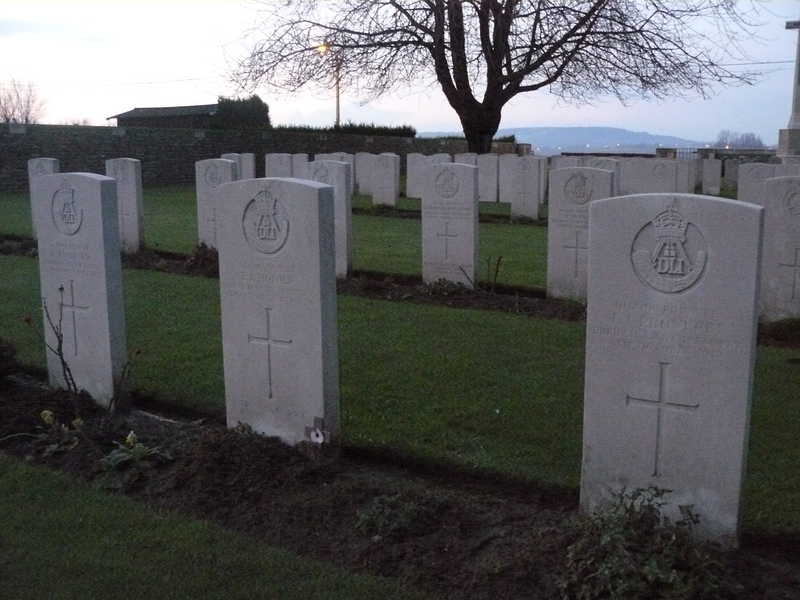 Note the German headstone in Row A nearest the camera. From the same spot, looking north east down the length of Row A. 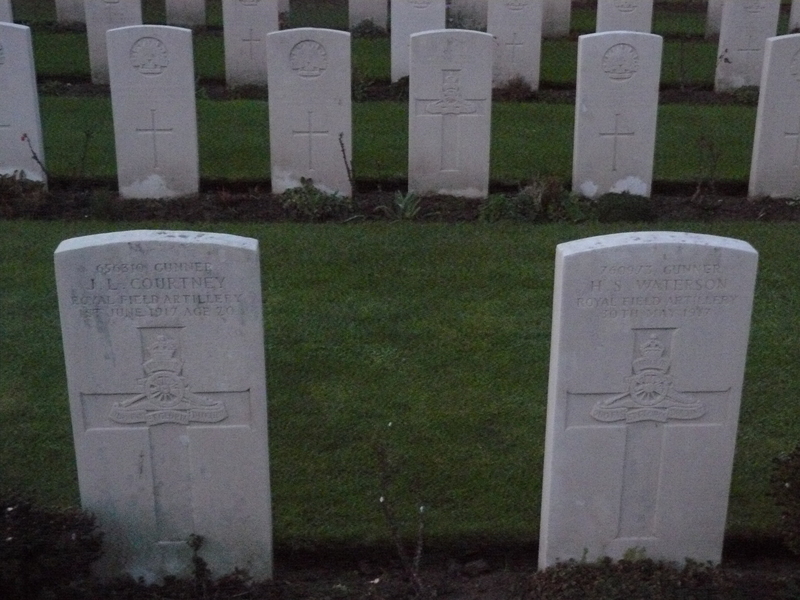 Two gunners, killed in the summer of 1917 and buried in Plot II Row D.
These men of the North Staffordshire Regiment, who lie together in Plot II Row H, were the final four burials made here before the Germans overran the area in April 1918. One wonders whether it might have been the Germans who buried them. At this point I really should own up, as the somewhat unnatural glow of the street lamp in the background rather gives the game away anyway. The reality is that by this time it was far darker than it appears in these pictures, and quite frankly, if I had any kind of editorial integrity, I probably shouldn’t include many of these photos in this blog in the first place. But needs must, and until I pay another visit, this is as good as you’re going to get. Probably best not to enlarge too many of these photos though. As if I can stop you. 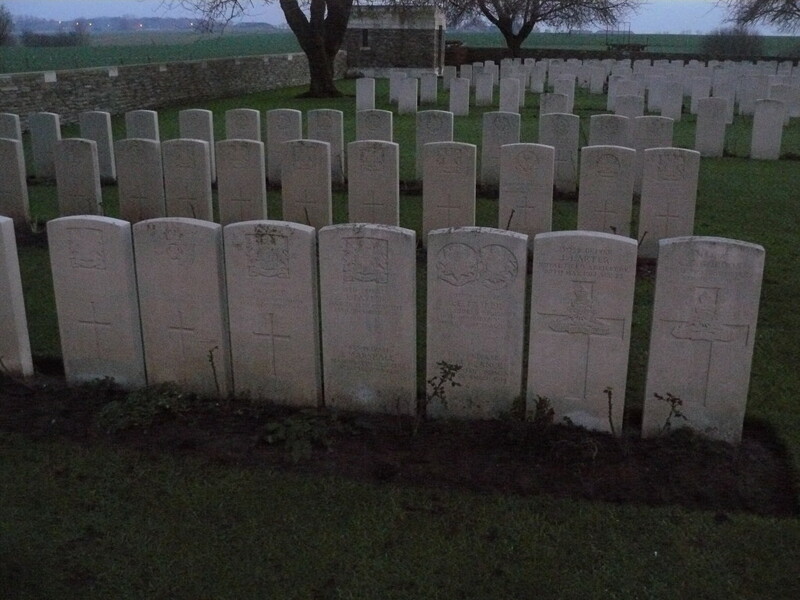 Men of the Durham Light Infantry in Plot II, killed in the fighting that took place as the war neared its end in October 1918. 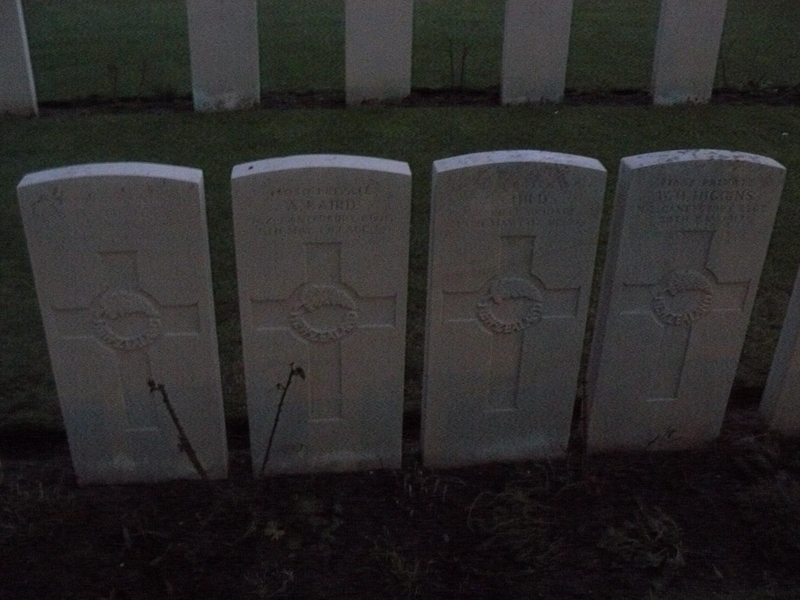 …these men of the Canterbury Regiment, N.Z.E.F. were killed in May 1917 and buried in Row D. It was the New Zealand Division who took over this sector in the spring of 1917 and who would attack the Messines Ridge from the trenches between Wulverghem (now Wulvergem) and Ploegsteert Wood on the morning of 7th June, during the opening phase of the Battle of Messines. They had previously set up two Advanced Dressing Stations, one here at Kandahar Farm to serve the north of their sector, and one at Underhill Farm for the south, New Zealand Engineers labouring to add protection to the farm buildings and make each as splinter-proof as possible*. 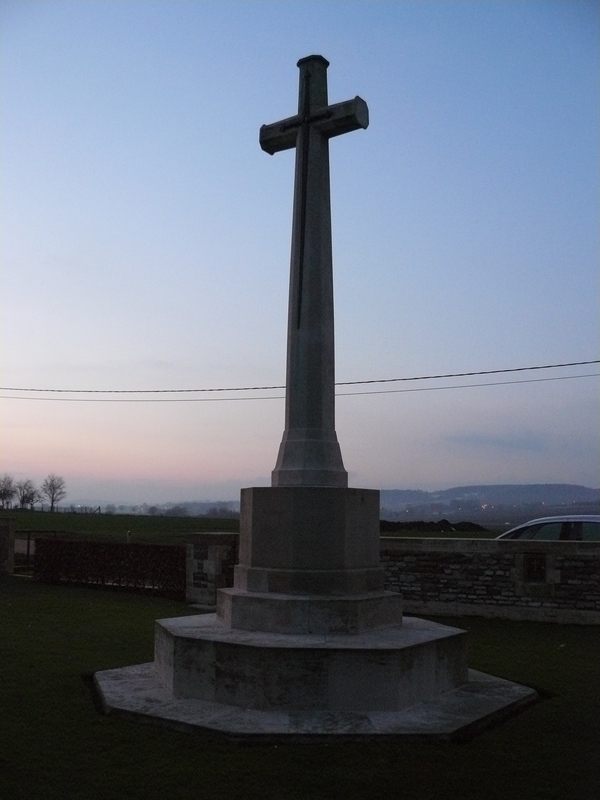 In this, the northern sector, casualties from the two Regimental Aid Posts at La Plus Douve and St. Quentin Cabaret would be ferried by either trench railway or ambulance to Kandahar Farm where up to 100 stretcher cases could be catered for at any one time within the ruined farm buildings. From here those that could be moved would be taken by road to the Corps Main Dressing Stations and Casualty Clearing Stations some miles to the east, and from there, if they were lucky, on to the base hospitals and then perhaps home to England. The unlucky ones remained here forever. *The rooms and cellars at Kandahar & Underhill Farms had been made virtually impregnable to shell fire unless they received a direct hit. Walls were reinforced with broken brick-filled sandbags, roofs were given extra support using pit-props and steel rails covered in concrete and protected by more sandbags, and the engineers even built new broken-brick roads to allow ambulances easy access to and from the dressing stations. Now I know you have seen this trench map before, but better too often than not enough. Kandahar Farm is just a few yards off the map following the road west to the bottom left. St. Quentin Cabaret and La Plus Douve Farm are still exactly where they have been all along, and if you follow the road east (right) you will come to Boyle’s Farm, sited close behind the front line, about which you will hear more shortly. On this trench map Boyle’s Farm is just beneath the large ‘U’ near the centre top of the picture, and at last you can see how close we have been to Messines throughout our visits to the cemeteries sited hereabouts. The evacuation of the wounded began at semi-permanent aid posts close behind the front line. One such, staffed by a Regimental Medical Officer, was situated at Boyle’s Farm, where strengthened dug-outs in a communication trench would be the first port of call for men freshly wounded in the line. 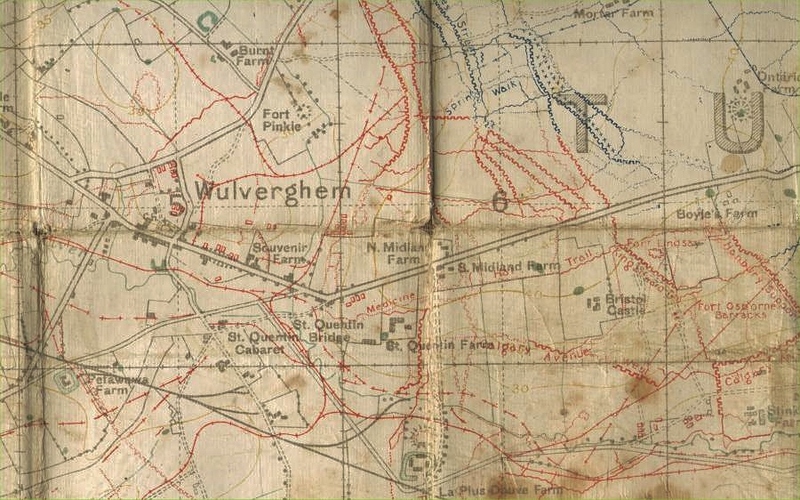 From there the route of evacuation followed a communication trench known as Boyle’s Cut which opened out, once out of direct sight of the Germans, on the Wulverghem road near St. Quentin Cabaret Regimental Aid Post, the journey continuing on, as we have already seen, to Kandahar Farm Advanced Dressing Station, and from there to one of the Corps Main Dressing Stations at Trois Arbres or Bailleul, where trains awaited to transport the survivors to the hospitals away to the west. 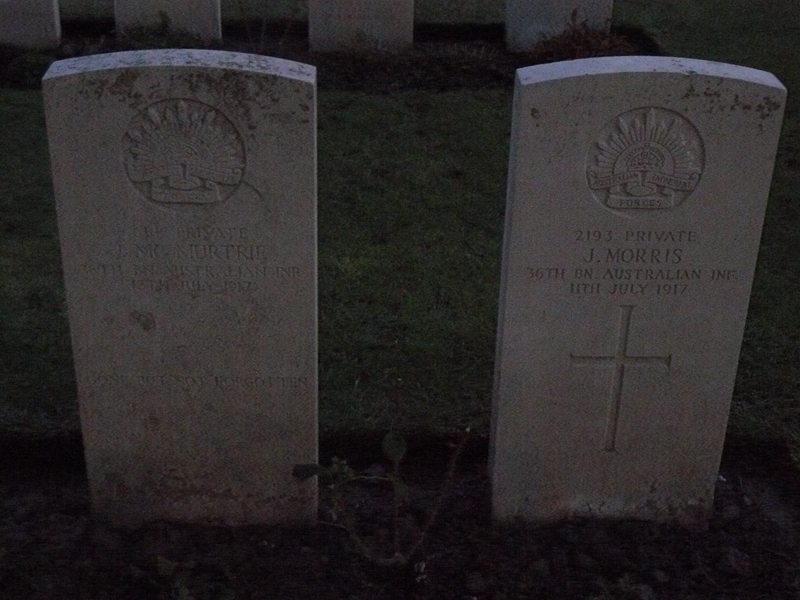 Two Australian Privates buried in Plot I Row C. There are 186 Australians buried here, the majority killed during the summer months of 1917. Plot I Row B. The Manchester Regiment men pictured above were all killed in December 1914; the two artillerymen to the right are casualties from 1917. The lights along the road to Kemmel glisten as dusk turns to dark. I think he wants to go home. 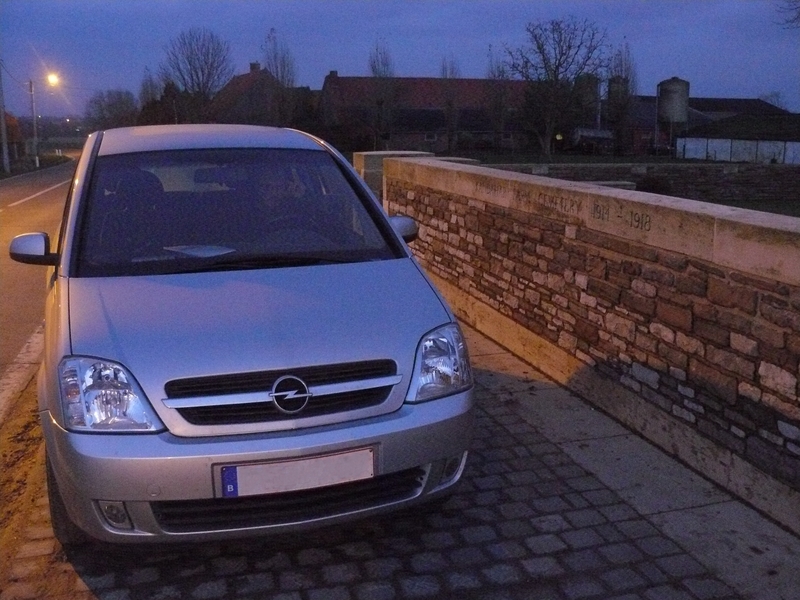 This entry was posted in Messines, Wulvergem. Bookmark the permalink. I have so often crossed that region by bike. Of course, I was aware of the fighting that has gone on during so many years. But to read all of this in detail … Next time, I’ll look around, looking for all those special places. Thanks for your comment Filip. As is sometimes the case, some of the information I discovered during my research on this area I was unaware of at the time of my visit, so the next time I’m there it will be different for me too. But it is really nice to know that even you, who know the area far better than me, have found something in these posts that has intrigued you enough to look more closely next time you pass through. 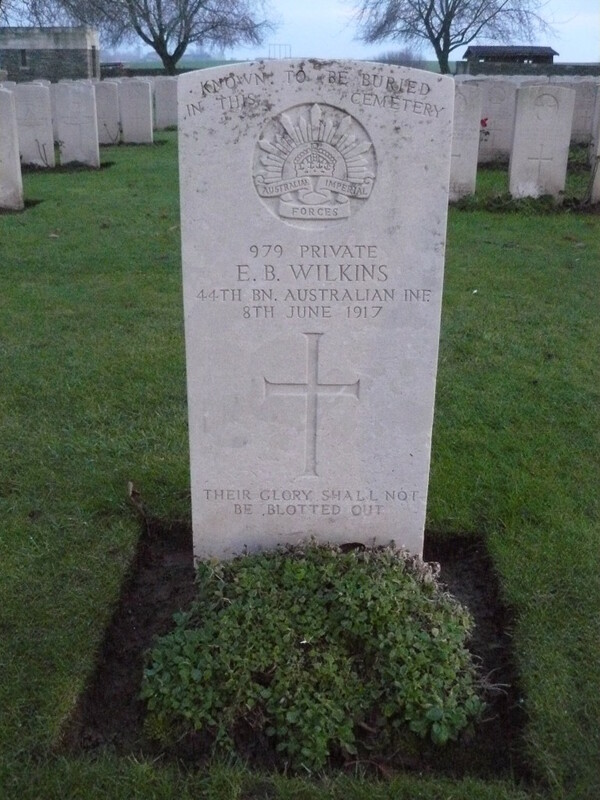 I visited this cemetery in both April and July 2012, in the hopes to see my great uncle Edward Burnell Wilkins grave. I was disappointed to discover the headstone had been removed for repair. Now, thanks to your photo, I have an accurate and current image of his final resting place. Thank you so much. You are most welcome Fiona. Glad to be of help. Thank you so much for the great information and photos. 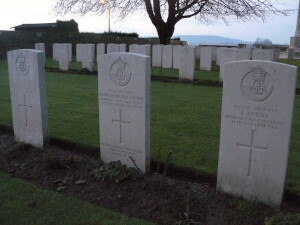 I’m researching my husband’s family and my daughter is doing a school assignment on a first world war soldier so we picked one of our family members and he’s buried in plot 2, row G. It’s lovely to be able to see his final resting place, as living in Australia we can’t easily get there to see it in person. Fantastic! Glad to be of help. Good timing too, as this post has only been up for a month. I wanted to find my great uncle’s grave earlier this year but the info I got from the C.W.G.C. web site wasn’t as accurate as yours. We are hoping to return next year and find my great uncle’s grave and let him know that his sacrifice is remembered. Rest in peace you were all true heroes. We will never forget. Well said Pam. And glad I could be of help. Just found your webpage,very helpfull! 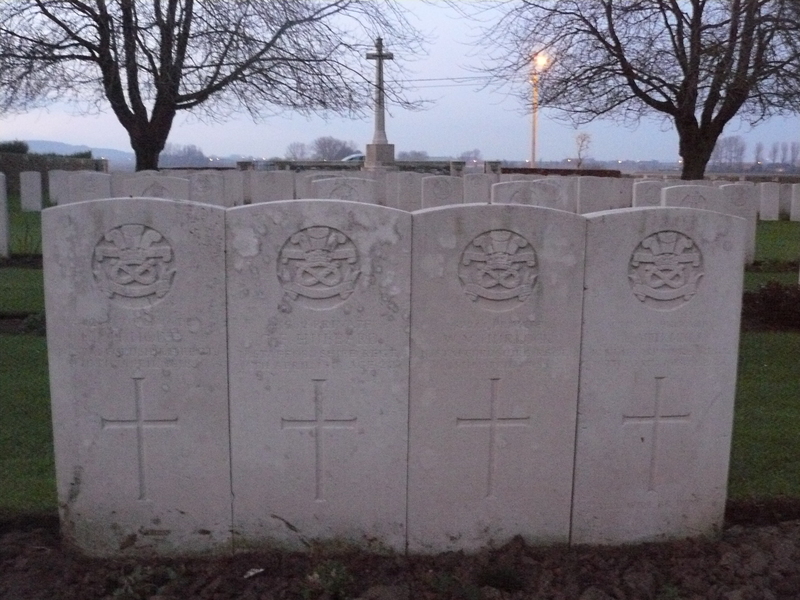 Learnt alot about the cemetery and how it came into use during the war.My great uncle Edwin henry Fryer is buried there,wounded messines ridge 1917,and died in the dressing station nearby. I visited there in 2004 mainly to trace my grandfathers footsteps during the war! What a lovely country to visit as a tourist,but must of been hell as a soldier in the war.I had a great experiance meeting alot of Belgian people there ,very friendly and warm and care deeply for Australia and New zealanders. Thankyou for your interest in this cemetery and being so helpfull to many Australian families!! Cheers Scott. Yes, there are quite a few Aussies who follow this site so I try to do my best. 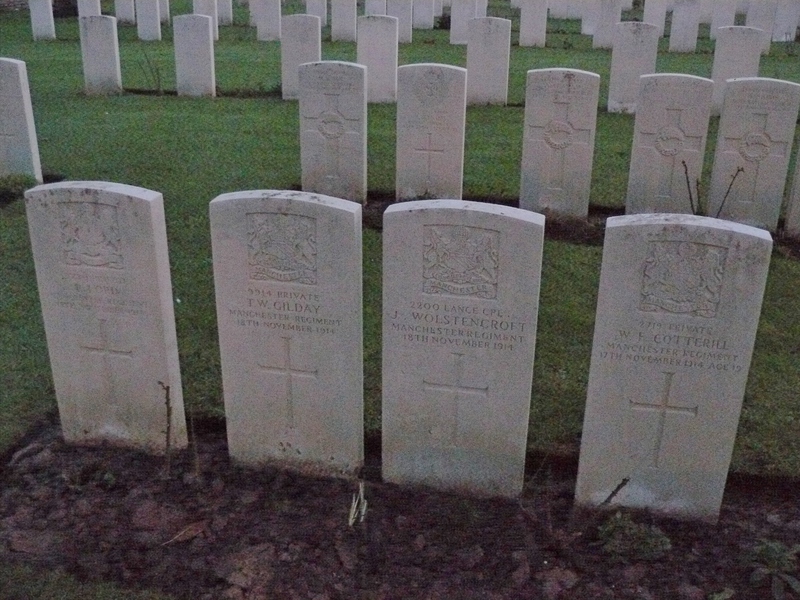 It’s a long way from Australia to Belgium and there will be many who cannot make the trip, so if I can give an idea of where Great Grandfathers and Uncles are buried, and show people that they are well cared for to this day, then I’m doing my job. Glad you found this post of help, and of interest. Thank you so much for all this information – my late Grandmother’s Brother is buried here and my Daughter and l are going to visit in a few weeks time and this will be the first time that any of his Kin have ever been to his final resting place. lt’s going to be an emotional event but we feel both honoured and proud to go and pay our deep respects on behalf of all his family, who never stopped loving and missing him. Thank you for your kind words Elizabeth. Glad I could be of help. I hope you both have a wonderful trip – it will indeed be emotional but it will be so worth it. Come back and tell us all about it! Hi – it’s me again! I meant to reply long before now to say what an amazing and emotional trip my daughter and I both had last year when we visited this cemetery to lay a poppy wreath on my Great-Uncle’s grave. He was one of the very first to be buried at Kandahar Farm as he was killed on 14th December 1914 age 21, when the cemetery was barely a month old, he was in The Manchester Regiment ‘Pte Joseph Taylor’ and lies in Plot 1.B.8 – we also placed a photograph of two of his sisters on his grave, (one of them being my Grandmother), obviously both now long gone but taken when he they still young. I grew up listening to stories of him and of the family’s heartbreak at never knowing what had really happened to him, or indeed if he even had a grave and how their parents seemed to age overnight – so tragic and so sad. If only they could have known what a truly beautiful place Kandahar Farm Cemetery is where their precious ‘Joe’ has been lay all that time. Somehow, in some small way, leaving that photograph behind with him felt like his loved ones had finally made it to his final resting place and we felt honored signing the visitors book on behalf of his entire family. Thank you so much for all the information you have provided on this website, it really did encourage and help us to plan and make our journey there – and for that, we shall be forever grateful. Hello Liz! Good to hear from you and thank you for taking the time to tell us about your trip. I am so glad that it was all you hoped it would be – the first members of Private Taylor’s family to visit. I understand what you mean about the very fact of leaving the photograph bringing, in modern parlance, closure. And I am also very chuffed with your final comments. My missus got quite tearful when she read them. As for me, if this little site can be of help to people like your good self out there, then I can sleep easy. P.S. I have added some text to the end of this post since you read it last year, in case you hadn’t noticed; you might find it of interest. Once again a late reply on my part, but just to say a big thank you for your reply and the for the added info which is really useful. Your commitment to all what you do is amazing and so helpful for so many people like myself so I really am very grateful. Thank you for this. 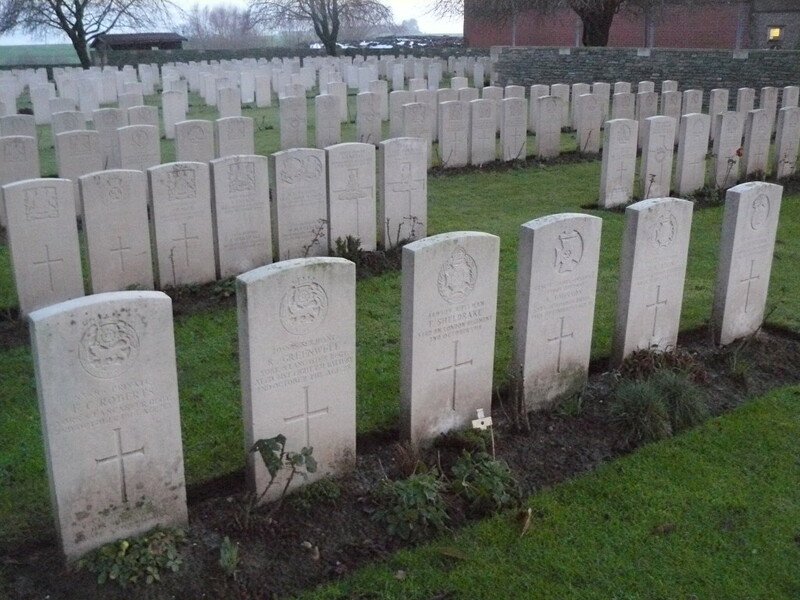 We have just visited the cemetery on the 100th anniversary of my Great Uncle Stanley Fransham’s death (7 June 1917). 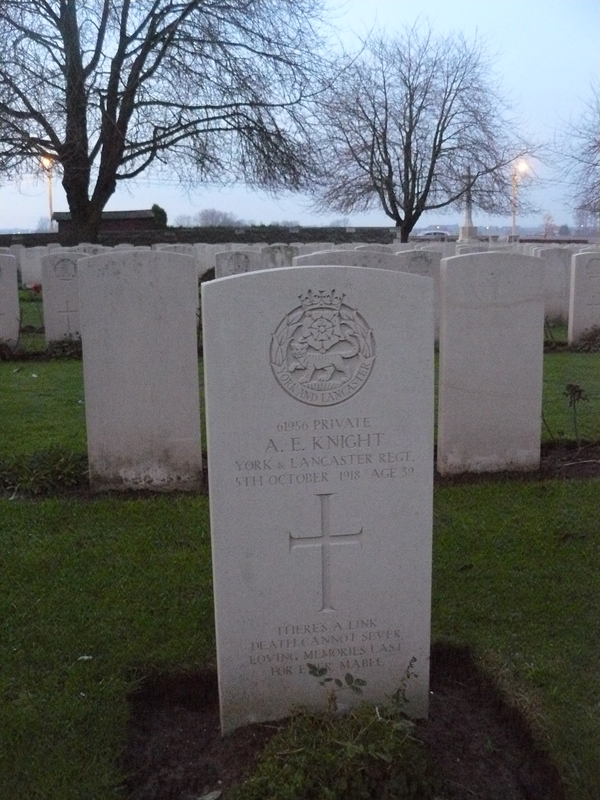 He is buried in Plot II, Row A. It is a beautiful place, and it was great to work out where he died, and to be there after all of these years. Thank you for the detailed information you have provided – it has helped our understanding no end. It is a long way from New Zealand, but so moving and meaningful to be able to spend time there, and to bring the love and thanks from our family. They are not forgotten. Hello Paul. Thanks for taking the time to comment, and glad you had a successful trip. You will understand, running a website such as this, that the whole evacuation of the wounded operation is of great interest, and, luckily for me, and you, the New Zealand Medical Archives online are excellent. If you are really interested, try this: http://nzetc.victoria.ac.nz/tm/scholarly/tei-WH1-Medi-t1-front-d5.html – and if you find I’ve made any mistakes, let me know!! 7th June 1917, by the way, is one of the most frequent dates mentioned on my website. Put it in the search box and pages and pages come up! The complete ‘Tour of the Messines Ridge’ naturally concentrates mainly on that date, the ‘Tour of Ploegsteert’ too has many references, and my recent ‘French Flanders: Armentières, Nieppe & Steenwerck’ tour has details about other dressing stations used during the Messines battle. Anyway, enough shameless self-publicising. Thanks for your kind words, glad I could be of help, and, as people such as yourself, travelling so far to visit, and websites like mine, prove – they are indeed not forgotten. Hello again Liz. A couple if days late in replying myself, but I have been sitting in a field for the last few days listening to some fine, and a little not-so-fine, music. Your comments are so kind – and if I needed any impetus to continue this little project I started six years ago – which I currently don’t, happily – words such as yours would, I am sure, work wonders. No problem about the Facebook page – I have had a look myself. All the posts I publish here also get published on Facebook & Linkedin. 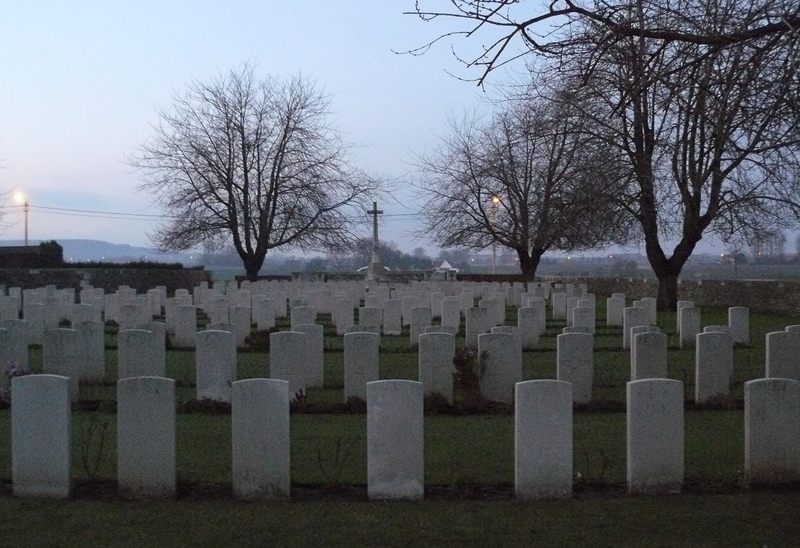 And once again, it’s pretty cool for me that this little site of mine finally got you out in Flanders’ Fields. Makes me smile.